You are here: Member pages » daniserralta » pictures » Leopard hunting. 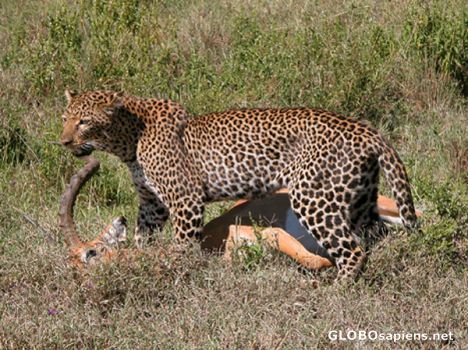 Leopard carrying a grand gazelle to feed himself. Try getting that away from him! Wonderfully portrayed expression. He really beautiful, I poe that he will enjoy his lunch, it nature, but I still feel sorry for the gazelle! Real and cruel like life itself. 5 stars picture, of course! excellent wildlife pic. wish i could see it someday. Natural brutal wild Africa. Regardless how you got to see this, definitely NOT a zoo! Well done, of my safari time totalling ~ 20 weeks, I never saw a kill this close! And all I can think is: lucky cow! 1. You get to see a leopard in broad daylight. 2. You get to see one with a kill. 3. You get a photo of it. You rascal! That's the shot I was trying to get when I was in Kruger! :-) Very, very nice. I don't know why it's not unanimously 5*'s. Dan/Dan, 5* wildlife photography but taken in a tourist environment. Was the kill photographedll? Brilliant and exciting anyway. Well done!